Girls lax: Aspen beats G.J. Aspen's Claire Boronski (23) looks for a break in the Grand Junction defense during Tuesday's game at Aspen School District Stadium. Claire Boronski scored two goals and had two assists, and sister Julia Bronoski also scored a goal in the Aspen victory. 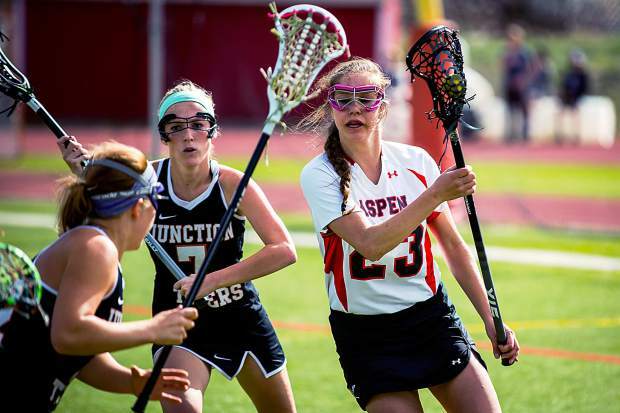 The Skiers anticipated a fast start from their opponents in the girls lacrosse game Tuesday afternoon in Aspen. But after visiting Grand Junction scored the first two goals of the game, the Aspen girls answered with a pair of first-half scoring flurries and an eventual 10-6 victory over the Tigers at sunny Aspen School District Stadium. The Skiers tied the game early on goals from Paige Johnson and Claire Bononski, both of whom would score again later. Mackenzie Miller scored Aspen’s third goal on a wraparound shot. But Grand Junction’s Caroline Jones tied the game on a shot after a penalty restart in front of the Aspen goal. The Skiers took the lead for good with 6:38 to play in the first half when Miller scored again, assisted by Boronski. By halftime, Aspen was up 8-4. “Hannah had some great saves in goal today,” Owings said of Aspen goalie Hannah Clauss. She limited the high-scoring Tigers to four goals in the first half and two in the second. Halle Harrison scored three goals for Grand Junction (3-2 in league, 4-3 overall). Jones had two goals. Alex Nicoletti scored Grand Junction’s final goal midway through the second half. “I’m really proud of the girls and really happy with the game,” Owings said, adding that the Skiers had played stretches of even sharper lacrosse last weekend in a win at Cherry Creek. Claire Boronski finished with two goals and two assists for Aspen. Julia Boronski also scored in the Aspen win. Johnson scored three times, and Miller scored twice. Jordan Fox also scored for Aspen along with Kendall Anderson. Tuesday’s win was the second this year for Aspen over Grand Junction. The Skiers beat the Tigers 12-11 in Grand Junction on March 16. Aspen’s only loss this season came at Fruita Monument 16-7.